At the end of the rainbow, you won’t find a pot of gold but Mount Vinicunca of the Peruvian Andes. We’re sure of it, judging by how the mountain is splashed out in colours ranging from maroon and turquoise to lavender and gold. Located near the equally majestic Ausangate, Mount Vinicunca is relatively a new phenomenon with its existence only discovered two years ago. 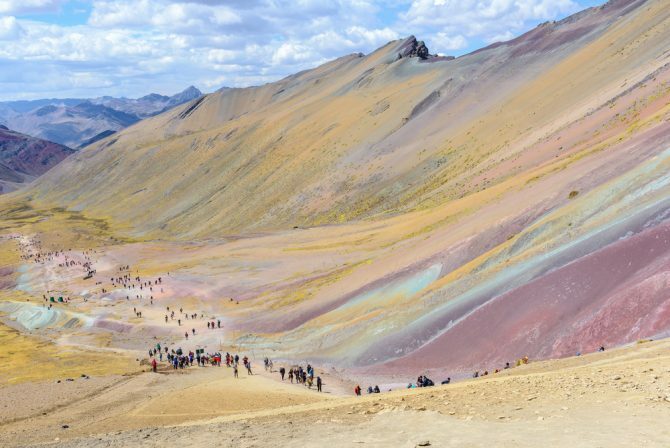 Referred to as “Montana de Colores” – the mountain of colours by the locals, while visiting travellers dubbed it simply as Rainbow Mountain, the painted wonder is swiftly finding its way on the top of everyone’s bucket list. 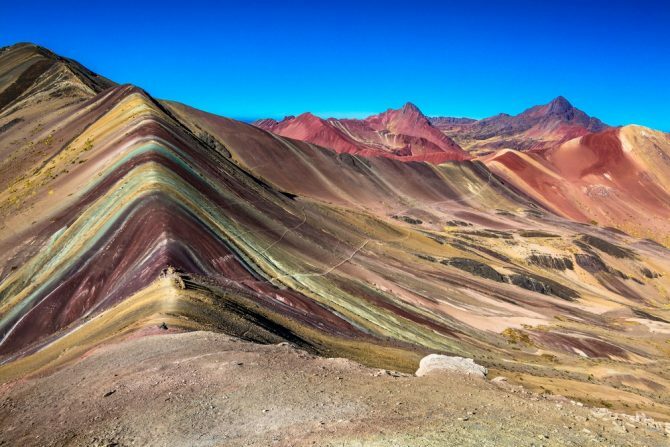 Towering at roughly 6,000 metres, Mount Vinicunca’s coat of many colours is attributed to its sedimentary layers exposed to years of environmental conditions and mineralogy. Like how a nail turns red when rusted, shades of red may indicate there’s iron oxide rust in the soil; whereas yellow could be due to the presence of iron sulphide. The journey to the Rainbow Mountain is gruelling. Day tours require you to be up at 3 am for a three-hour-long drive from the nearest tourist hub of Cusco. As daylight begins to peek, you’ll find yourselves at the mountain’s foot where your six kilometre-trail commences. A word of caution: The hike up the coloured mountain is no joke with fluctuating weather conditions combined with high altitude. But the culminating reward of breathtaking mountain views (in a spectrum of colours to boot) makes it worth your time. And at any point where your legs don’t work like they used to before, then climb on the back of a horse for a fee and finish the trail. Peru’s business-minded locals have cleverly stationed their steeds throughout the trail. Avoid the wet seasons from January to April, where roads and trek paths are almost impassable, and go in the dry season of May to October.